Do the old floors in your home need an upgrade? 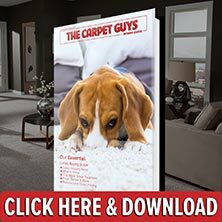 Book your free carpet installation estimate with The Carpet Guys and renovate them today. As the top carpet dealer in Trenton, we know what you’re looking for. You want quality flooring products at a fair price. In our warehouse, we stock our shelves with the most popular brand name carpeting available, and the prices are inexpensive. We want to provide the opportunity for our customers to experience the joys that new carpeting can bring. Many people who settle for carpet with free installation typically end up with poor craftsmanship and unprofessional service. Do yourself a favor and get your carpet installed from the best place to get carpet in Trenton. Don’t settle with an unprofessional carpet company when you can get your job done the right way. Book an estimate with The Carpet Guys – the best carpet dealer in Trenton. Plush Carpet – For any room that has a more classy design, this is the perfect style of carpeting. Plush provides a luxurious velvet-like feel that no other style will. Frieze Carpet – Give your informal and casual rooms a hint of personality with Frieze. You’ll notice the flair it gives off right away. Berber Carpet – Install the durable and long lasting Berber for any room that experiences a lot of foot traffic. It also masks dirt intrusion very well. Looped Carpet – Want a little extra interest underfoot? You can’t go wrong with our multi-leveled looped carpet. Find it in many patterns and colors. Ready to get the carpeting you have been looking for? Book your free estimate with us today!